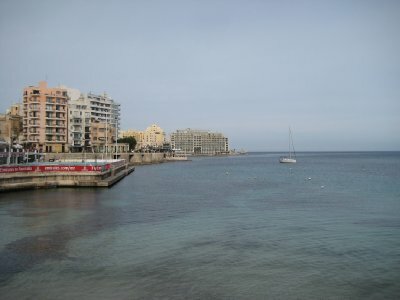 View Malta December 2011 on GregW's travel map. As November came to an end, I looked at my remaining vacation balanced and realized that I had almost as many vacation days left for 2011 as there were working days left. Booking off the time between Christmas and New Years and with carrying forward a week of holidays, I still needed to take a full week off sometime in December. So I booked a week and undertook the last minute planning of the unprepared. 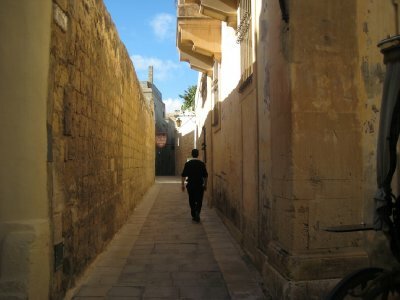 After searching the internet for cheap flights and cheaper hotels, I wound up with a week to spend in Malta. 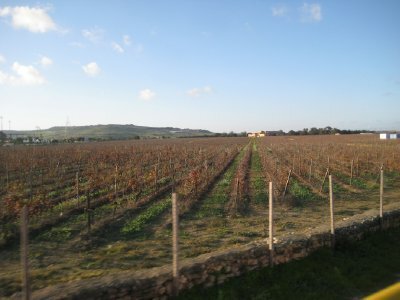 The Republic of Malta is a country that are a series of islands in the Mediterranean, 80 km south of Sicily and 284 km east of Tunisia. 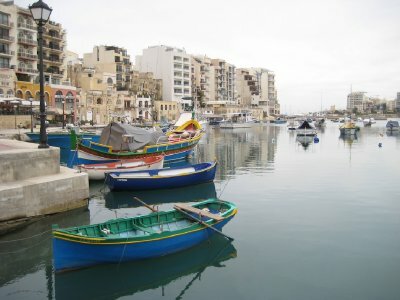 Situated rather strategically in the middle of the Mediterranean, Malta has throughout history been ruled and conquered by a number of people including the Romans, Arabs, Knights of St John, French and the British before gaining independence from the United Kingdom in 1964. 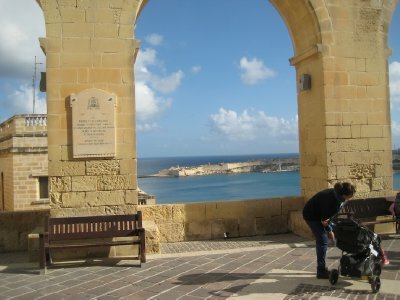 Malta joined the EU in 2004 and in 2008 become part of the Eurozone (Not the greatest timing on that). 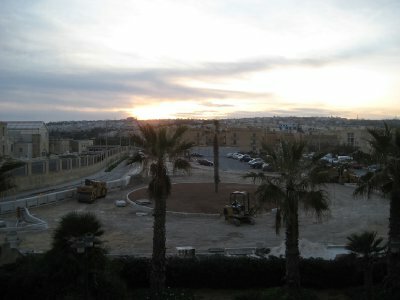 I was staying in St. George's Bay, part of a continuous urban area that runs along the east coast of the main island that also includes Valletta, the main city and capitol. The whole area seems to be in a state of flux - half new and half old, half under construction and half being torn or falling down. 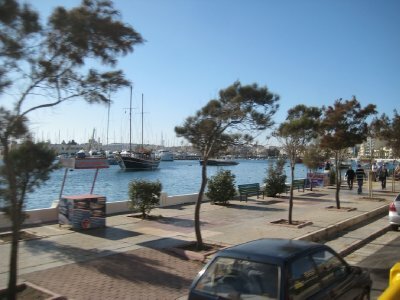 Along the seafront there are numerous new hotels and luxury flats, with fancy restaurants. There is a lot of construction under way, especially as it was the low season when I was there and the construction industry was taking advantage to build. At the same time, though, between the new buildings and construction sites were older buildings - some faithfully maintained, while others looks right ready to fall over. I got myself a decent deal on the Corinthia Hotel, a five start that was going cheap because of the low number of travellers during early December. The hotel included a number of restaurants and bars, including Henry J Bean's American Bar, which offered two-for-one drinks during happy hour from 18:00 - 19:30 each night, and had a decent chicken wing appetiser. 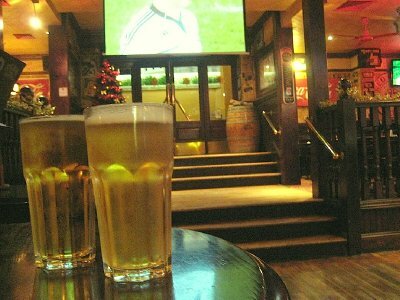 One evening I was there enjoying my two-for-one pints of Cisk beer and watching the biathlon on Eurosport on the big screen. Biathlon is a winter sport that combines cross-country skiing with target shooting. A woman, who was ordering at the bar, saw me watching and asked me in a Manchester accent what I was watching. I explained it was biathlon. "I've never heard of it," she said. "There aren't many great British bi-athletes," I said. 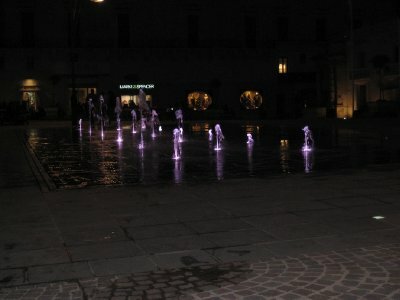 "It is more popular in the Nordic countries and Russia." Just as I said that, the announcer indicated that the French team was leading the race. "...and other countries," I said. "Who are you cheering for?" she asked. "Canada, where I am from," I said. "How are they doing," she asked. "Not bad, for Canada, they are eighth. That's good for us. I don't know why Canada doesn't do better at biathlon. We have lots of snow, plus there are wolves and polar bears and such that a rifle is good to protect against. There is so much wide flat space covered with snow that Canadians have to cross. You would think we would be good at skiing long distances punctuated with the occasional need to stop and shoot something." The Maltese honey bee, Apis mellifera ruttneri, is a sub-species of the Western honey bee, and is native to Malta. 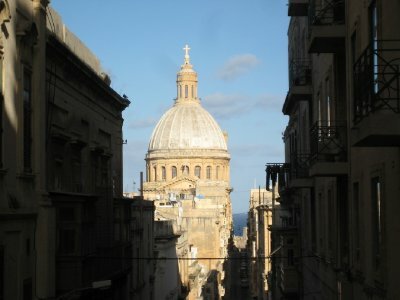 The origin of the term Malta is uncertain. 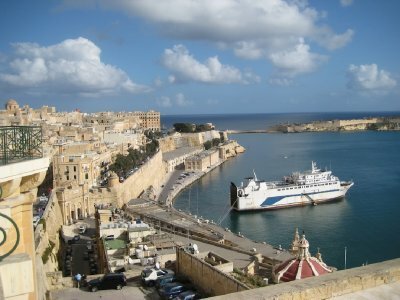 One of the most common etymology is that the word Malta derives from the Greek word meli, meaning "honey". I was mostly in Malta to relax, but did get in some site seeing. It is a place with a long history, and to get a feel for it decided to do one of those hop-on/hop-off bus tours that take you round to various sites. 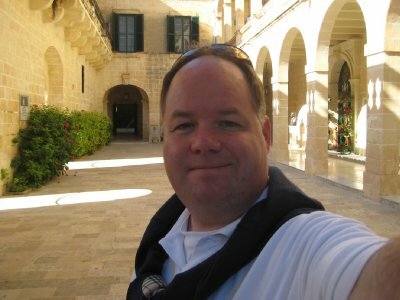 We breezed through Valletta (which I would go and see the next day), and spent my time in San Anton Gardens, Mdina and Rabat. 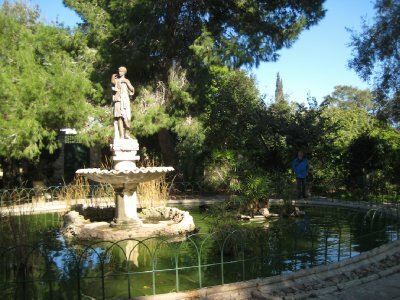 San Anton Gardens is home to the Presidential Palace, as well as a large and diverse garden. Mdina is the old capital of Malta, a medieval walled town situated on a hill in the centre of the island with views off to the Mediterranean. 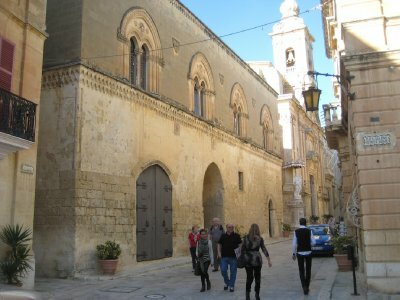 The oldest building in Mdina is Palazzo Santa Sofia, of which the ground floor dates back to the 1200s. 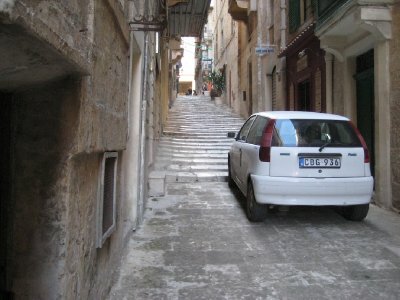 The rest of the city is thin streets, and stone buildings. 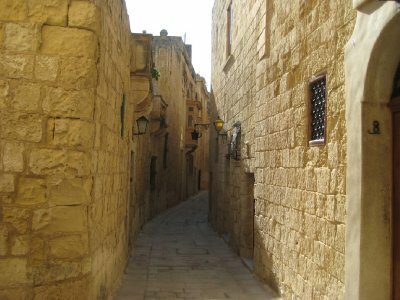 The island of Malta is very rocky, made of limestone, and many of the buildings - whether old or new - are made of the same limestone. 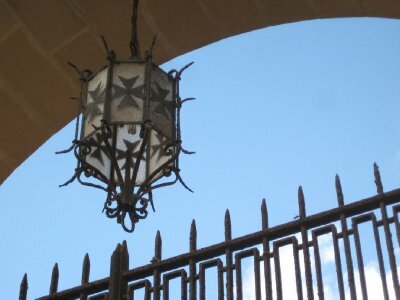 Outside of Mdina is Rabat (the Arabic word for suburb), which contains St. Paul's Catacombs. 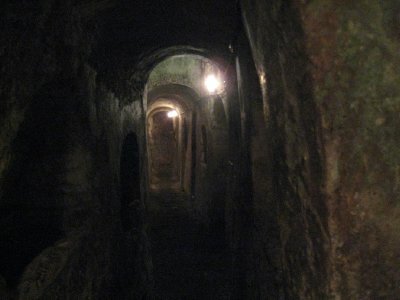 The catacombs were used for burials of all manners of faith and people from the 4th century to the 9th century. Some of the catacombs are open to the public, and you can see where numerous burials had taken place. After wandering around, while waiting for the next tour bus, I grabbed a drink called a Kinnie. 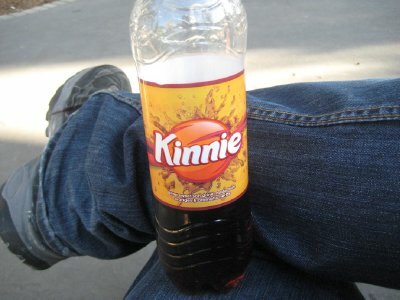 According to their website, "Kinnie was originally developed by Simonds Farsons Cisk in Malta in 1952, as an alternative to the innumerable colas that had proliferated in Europe since the Second World War. Kinnie is a unique tasting, alcohol-free, natural, refreshing beverage. Its golden amber colour, and the fact that it is made from bitter oranges and a variety of aromatic herbs, lend this beverage a bitter taste which is an excellent thirst quencher. " It tastes something like a orange-flavoured ginger beer. It wasn't an immediate hit for my taste buds, but I could see it becoming a taste I could acquire. 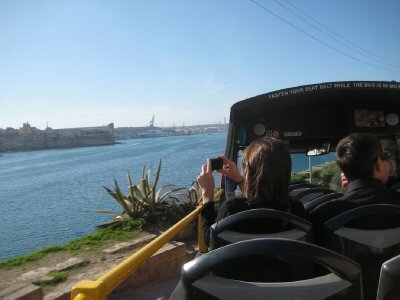 The next day I went to Valletta, the capital of Malta. It is high on a hill on the water, and has massive walls. 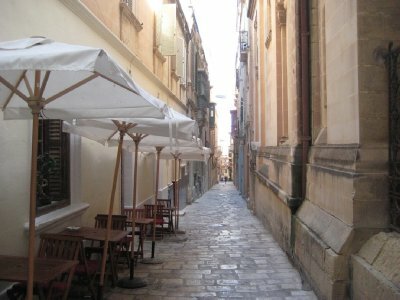 The city was founded by the Order of St. John of Jerusalem, the knights which ruled the island from the 1500s through the 1700s. 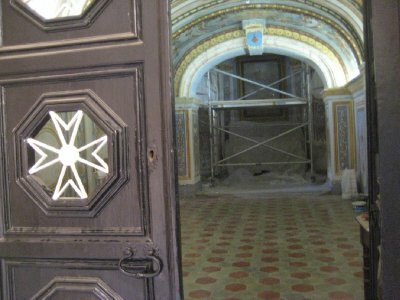 The Knights of Malta, as their were known, defended the island in 1565 against the Ottoman empire. 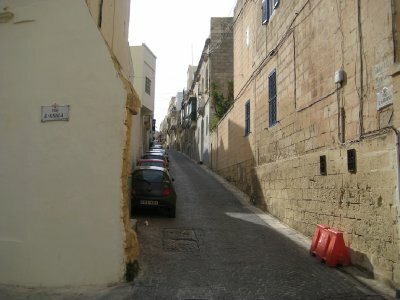 Immediately after the end of the Siege of Malta in 1565, the Order decided to found a new city on the Xiberras peninsula to fortify the Order's position in Malta. The city is named after the Grandmaster of the Order, Jean Parisot de la Valette, who founded the city by placing the foundation stone on 28 March 1566. 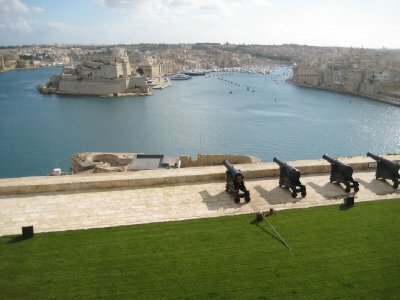 The Great Siege of Malta in 1565 occurred when the Ottoman's tried to capture the island. The Ottoman Empire wanted to take the island to give them a strategic advantage for control of the Mediterranean over the Christian nations. Suleiman the Magnificent, sultan of the vast Ottoman empire, sent 200 ships with 40,000 fighting men and another 9,000 cavalry. On the Knights side were the 600 knights, plus a few thousand mercenaries and a few thousand Maltese irregulars – in all between 6,000 and 9,000 men. Despite the differences in numbers, the Knights were able to hold the island thanks to its rocky, hard to take shoreline as well as the toll which sailing from Turkey took on the Ottoman soldiers through disease. After three months, what was left of the invading Ottoman force gave up and returned home. A third of the defenders died, and up to 30,000 of the Ottoman's might have died, though numbers are disputed. 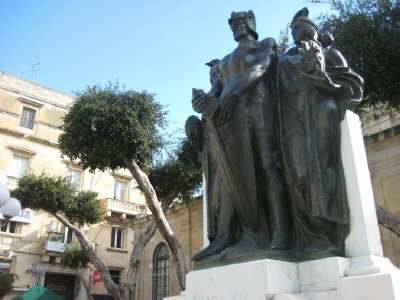 In central Valletta, there is a monument to the defenders of Malta. 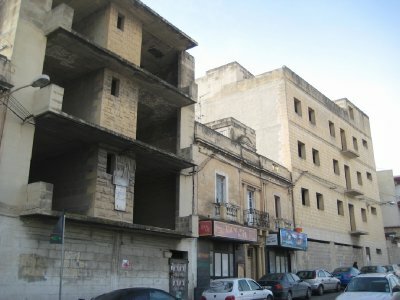 The second great siege of Malta occurred in the early 1940s, as the Axis forces of Germany and Italy attempted to gain control of Malta, which was being used by the Allies as an air and naval base. The attacks included a blitz by the German air force. 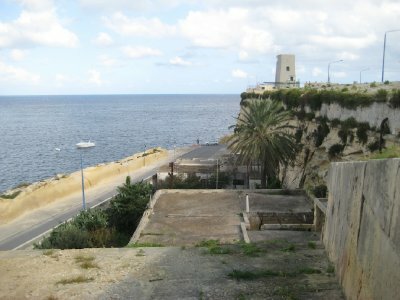 6728 tons of bombs to fell on Malta in April of 1942, 36 times the amount to fall on Coventry. 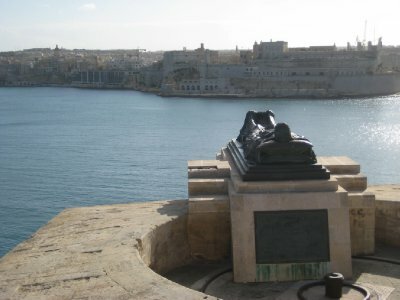 In March and April 1942 more bombs were dropped on Malta than fell on London during the entire Blitz. 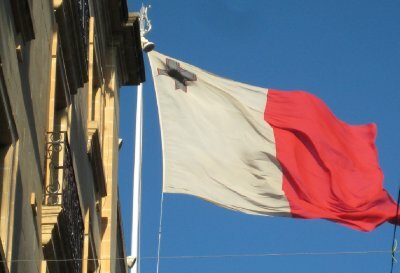 Malta's people and her defenders were awarded the George Cross by King George VI for their bravery during the air raids "To bear witness to the heroism and devotion of its people during the great siege it underwent in the early parts of World War Two." 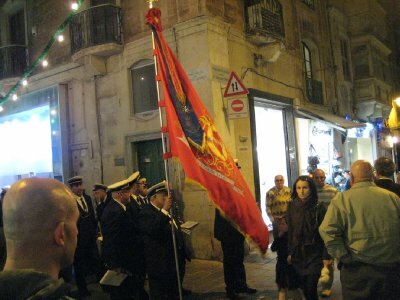 December 13th, when I was in Valletta, was Saint Lucia day, and in honour there were marching bands heading through the streets of Valletta. 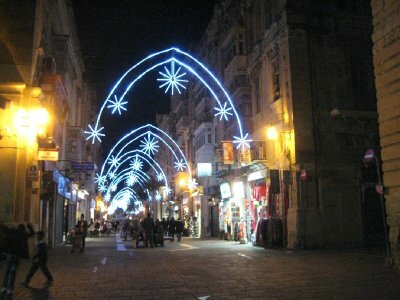 The city was done up in its Christmas' finery, as well. 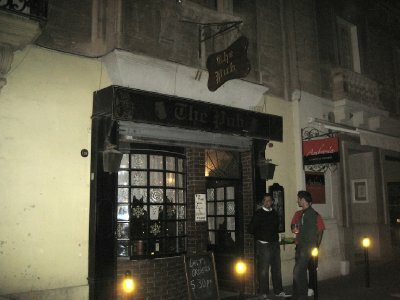 Round the corner from the busy Republic Avenue and St. George's Square was The Pub. The Pub is a small little watering hole, a cozy place filled with lots of British Naval memorabilia. 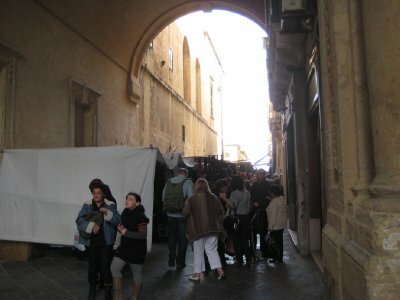 It is also the place where Oliver Reed, while in Malta filming Gladiator, died after a bout of drinking. On the night he died, Reed had supposedly drunk eight pints of lager, 12 double rums and half a bottle of the Famous Grouse, and beaten a few young sailors in arm-wrestling contests. The pub is now also partially a shrine to Reed. I had a pint in The Pub, just getting in at 5:25 PM for last orders. Apparently it often closes early. 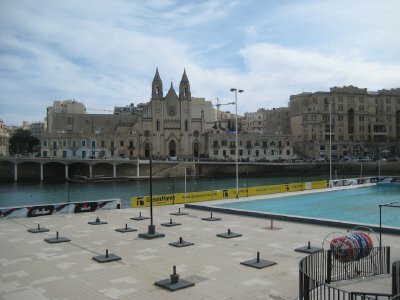 Next to Valletta is Floriana. 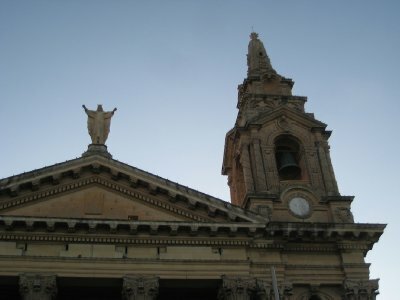 In Floriana There is a church there dedicated to Saint Publius. 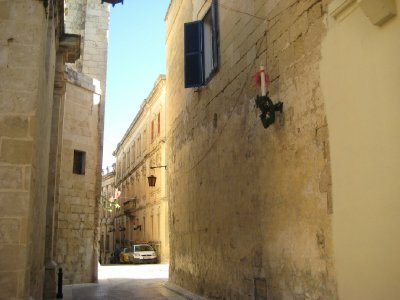 Publius was the Roman governor of Malta. After Paul the Apostle was shipwrecked on Malta, he met Publius, and after healing his feather, converted Publius to Christianity. So when this was done, others also, which had diseases in the island, came, and were healed. 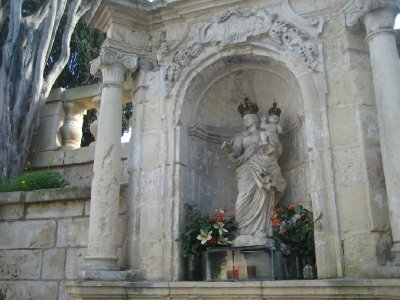 Publius went on to become the Bishop of Malta, and Malta became one of the first officially Christian countries in the world. Catholicism was written into the 1974 constitution as the island's official religion. 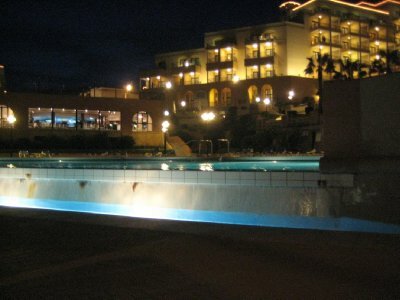 As an island, the cuisine of Malta has a number of seafood options. In addition, rabbit features on the menu. There is a Maltese cheese, as well. The Maltese goat breed, as the name suggests, originates from the island of Malta. 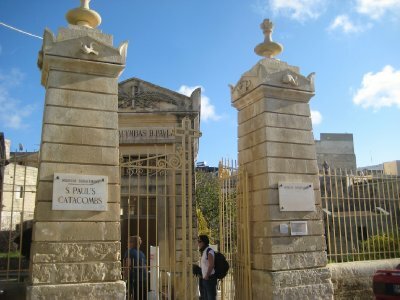 It produces a large quantity of milk: from 500 to 600 kg of milk for 270–300 days, from which the Maltese goat cheese is made. A name derived from Honey and goat's milk aplenty? 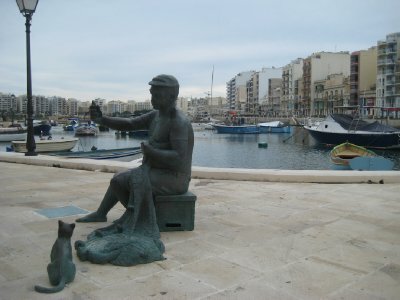 Malta, the land of goat's milk and honey. It looks like a blast! How lucky to have so much vacation time! It is kind of strange that the Canadians aren't better at biathlon when you lay it out like that. I mean, the vast open spaces of snow with the occasional need to shoot something is probably *exactly* why Norwegians are so good at it! Canada finished 9th. Not bad. "Something about girls with guns..."